Searching difficulty: Finding the ruins requires some searching. They are not visible from afar nor any signposts lead to them. Driving from Bolków down the road no 5 for Lubawka, you cross Kamienna Góra. There at the sharp turn of the road no 5 to the left you need to turn right towards Antonówka. Then drive straight on and to the right down the hill into side road. At the bottom there is a sewage treatment plant located and directly opposite to it, on the right side there are the ruins of the castle. 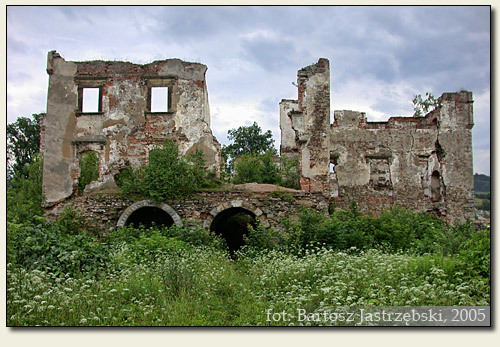 Two castles existed in Kamienna Góra. The first of them was raised probably in the years of 1289-1292 on the initiative of the duke of Świdnica-Jawor, Bolko I. It was supposed to be erected on the hilltop above the town, presumably in the surroundings of the present cemetery, quarry and waterworks station. The other castle, named Kreppelhof, built in the middle of the XVIth cent. probably by order of chancellor of the dukedom of Świdnica-Jawor, Hans Schoff. 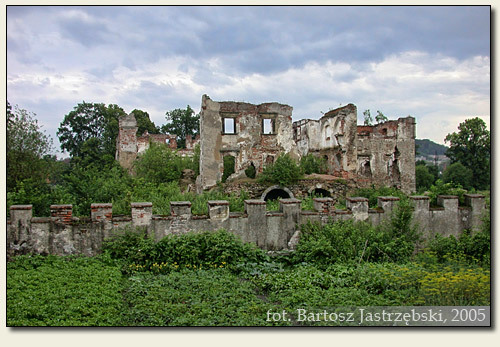 In a short time the castle was enlarged in 1588 by the family of Schaffgotsch. The subsequent reconstruction took place in 1872 on the initiative of the count Udo zu Stolzenberg-Wernigerode. Operations during the World War II did not damage the mansion, however, in 1964 the fire consumed it and since then it has remained in ruin.